Beginning with October 5, Audi will accept orders for its all-new flagship model set to carry a starting price in Germany of €90,600 (€6,600 more expensive than the outgoing model) for the entry-level A8 55 TFSI Quattro model. 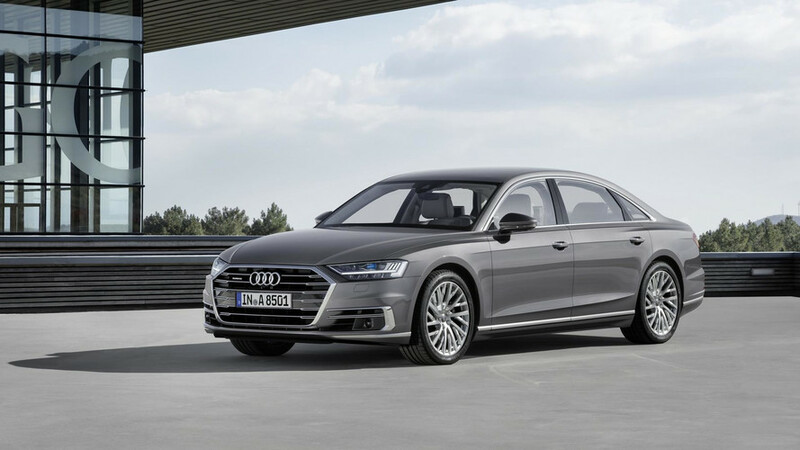 Paving the way for the company’s new somewhat confusing nomenclature, the fourth-generation A8 will be initially offered with a V6 3.0-liter TFSI engine delivering 340 horsepower (250 kilowatts) and 369 pound-feet (500 Newton-meters) of torque. 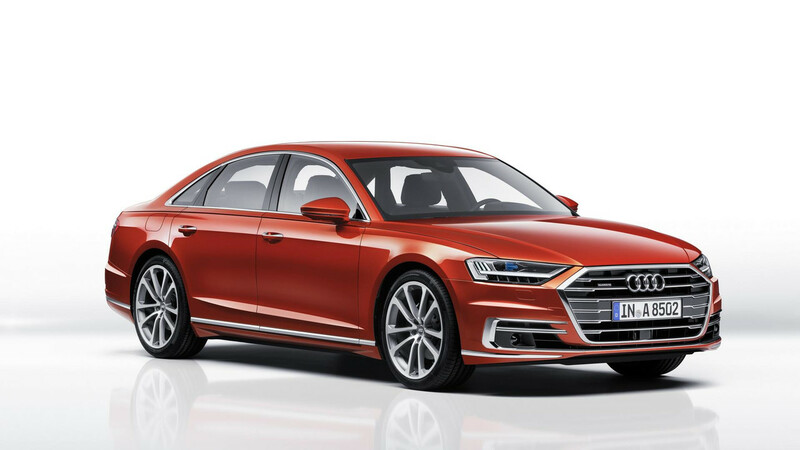 Equipped with the gasoline unit, the fullsize luxury sedan will sprint to 62 mph (100 kph) in 5.6 seconds or a tenth of a second later if you opt for the A8 L available from €94,100 (€4,200 increase). The other engine available upon launch is the familiar V6 3.0 TDI with 286 hp (210 kW) and 443 lb-ft (600 Nm). It’s good for a sprint in 5.9 seconds onto an electronically governed top speed of 155 mph (250 kph). Name of the model? That would have to be A8 50 TDI Quattro. Regardless of the engine you go for, the new A8 features as a mild-hybrid setup bringing an extended start/stop function, engine-off coasting, and brake energy recuperation to slash fuel consumption by up to 0.7 liters / 100 km in real world driving conditions. The S-Class, 7 Series, and LS rival comes fitted with a belt alternator starter as an integral component of the 48-volt main electrical system. For those in need of more power, the beefier 4.0 TDI and 4.0 TFSI units with eight cylinders are both set to arrive sometime in 2018 when most likely the engine range will be topped by the silky smooth W12. Further down the line, the S8 will be back and could be joined by a plug-in hybrid S8 E-Tron, with both rumored to use powertrains from the Porsche Panamera. Details about the U.S.-spec version have not been disclosed so far, but Audi could decide to show the A8 for North America as early as December in Los Angeles or a month later in Detroit. When it will arrive, it's going to command a premium over the outgoing A8 L priced from $82,500. At the Audi Summit in Barcelona the brand with the Four Rings celebrated the world premiere of the new Audi A8. Customers in Germany will be able to order the luxury sedan from October 5. With strikingly stylish design, first-class chassis solutions, a touch operating concept and the electrification of all drive units, the fourth generation of the A8 provides the latest reference for Vorsprung durch Technik. The basic price in Germany for the flagship is 90,600 euros; the long-wheelbase version starts at 94,100 euros. The Audi A8 starts out in the German market with two V6 turbo engines: a 3.0 TDI and a 3.0 TFSI. The diesel unit with a displacement of 2,967 cc produces 210 kW (286 hp) and develops 600 Nm (442.5 lb-ft) of torque. It propels the A8 with its standard-fit quattro drive from zero to 100 km/h (62.1 mph) in 5.9 seconds and on up to an electronically limited top speed of 250 km/h (155.3 mph). Its NEDC fuel consumption is just 5.8 to 5.6 liters* per 100 kilometers (40.6-42.0 US mpg). This corresponds to CO2 emissions of 152 to 145* grams per kilometer (244.6-233.4 g/mi). The 3.0-liter turbocharged direct injection gasoline engine delivers output of 250 kW (340 hp) with torque of 500 Nm (368.8 lb-ft). As a result, the A8 takes 5.6 seconds to sprint from 0 to 100 km/h (62.1 mph), and the A8 L takes 5.7 seconds. Fuel consumption per 100 kilometers is between 7.8 and 7.5 liters* (30.2-31.4 US mpg) for both body variants; CO2 emissions are between 178 and 171* grams per kilometer (286.5-275.2 g/mi. Both engines use a belt alternator starter, which lies at the heart of the 48-volt main electrical system. This mild-hybrid technology enables coasting with the engine switched off and a smooth restart. It also has an extended start/stop function and a high recuperation output of up to 12 kW thanks to energy recovered during braking. The combined effect of these measures is to bring down the fuel consumption of the efficient engines even further – by as much as 0.7 liters (0.2 US gal) per 100 kilometers (62.1 mi) in real driving conditions. 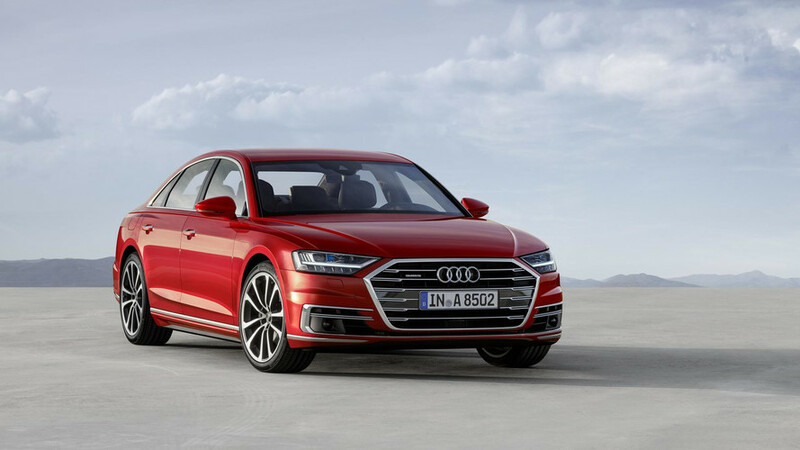 The luxury sedan comes with a three-liter diesel unit in the Audi A8 50 TDI quattro, while the Audi A8 55 TFSI quattro features a V6 gasoline engine. The A8 is the first production model to feature the brand’s new type designation clearly at the rear. The reference value for the double-digit number combination is the power output of the individual model in kilowatts. The numeral combinations increase in increments comprising five designations each, and they represent the hierarchy within both the respective model ranges and the brand’s overall model portfolio. Thus the numeral combination “50” will in future appear on the back of those models which deliver between 210 and 230 kW of power; “55” stands for the power output range between 245 and 275 kW. This new system will allow Audi to standardize the type designations for its worldwide range of automobiles. The Audi A8 signals the dawning of a new design era for the entire brand. It stands for sporty elegance, progressive status and sophistication. The front-end with its broad, upright Singleframe grille, the fluidly muscular vehicle body, and the rear with the continuous light strip exude a strong presence. The interior has a deliberate minimalist feel. Audi carries its high quality standards into the digital age with a revolutionary operating concept. Two touch displays located in the center slot almost seamlessly into the high-gloss black surface thanks to black-panel technology. When the driver activates a function on these displays with a finger, they hear and feel a click by way of confirmation. The combination of acoustic and haptic feedback along with common touch gestures such as swiping make the new MMI touch response safe, intuitive and quick to use. With more than 40 driver assistance systems, the A8 becomes the new gold standard among the competition. It is the world’s first production automobile to have been developed specially for conditional automated driving. The Audi AI traffic jam pilot will take charge of driving in slow-moving traffic at up to 60 km/h (37.3 mph) on highways and multi-lane motorways with a physical barrier separating the two directions of traffic. From 2018, Audi will gradually be taking piloted driving functions such as parking pilot, garage pilot and traffic jam pilot into production, depending on the legal situation in the particular country. During piloted driving, a central driver assistance controller now permanently computes an image of the surroundings by merging the sensor data. In addition to the radar sensors, a front camera and the ultrasonic sensors, Audi is the first car manufacturer also to use a laser scanner. The new Audi A8 will be produced at the Neckarsulm plant in purpose-built production facilities and will be launched onto the German market at the end of November 2017. Customers can order the luxury sedan from Thursday, October 5.